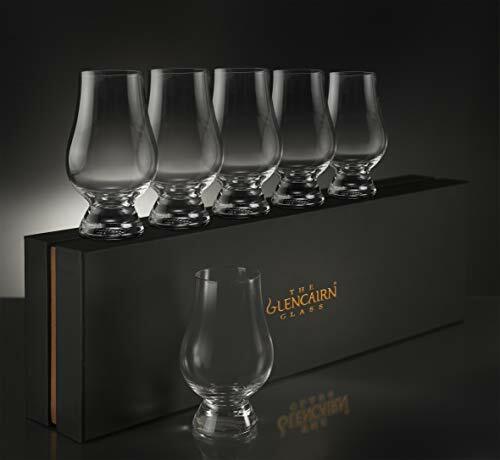 GLENCAIRN SET OF 6 GIFT BOX: The Glencairn Whisky Glass is a revolutionary whisky glass that really lets one savor the taste and complexity of fine whisky. This glass is specifically designed for drinking whiskey; its wide crystal bowl allows for the fullest appreciation of the whiskey's color, while the tapering mouth of the glass captures and concentrates the aroma on the nose and enhance taste. Plus, this design also allows the glass to fit comfortably in your patron's hand for an overall more enjoyable drinking experience. Place this glass in a flight with your finest single malts and aged blends, allowing guests to savor their complex flavors. These are great to use for any of your Single Malt Whisky's, Irish Whiskey's, and also your single barrel bourbons. Any malt advocate will love this glass! Known as the standard for tasting scotch whiskey, this elegant, crystal-clear glass will add a new level of sophistication and aesthetic appeal to your drink presentation. || Made of 100% lead-free crystal, Stolzle provides higher clarity and brilliance than comparable glassware which contains lead. Each of Stolzle's glass products undergo a special fire tempering process, increasing hardness and durability, and therefore reducing the risk of breakage. With the Stolzle Glencairn glass, your favorite whiskeys are sure to always look and taste their very best. (1) Gift Box of (6) Glencairn Stolzle Whiskey Glasses || High quality glassware designed and made in Scotland. Specifically designed for drinking whiskey. The wide crystal bowl allows for the fullest appreciation of the whiskey's color, while the tapering mouth of the glass captures and concentrates the aroma on the nose and enhance taste. Unique design allows the glass to fit comfortably in your patron's hand for an overall more enjoyable drinking experience. Impress or gift your friends with this set of lead free whiskey glasses to bring out at parties or casual evenings. A lovely addition to your collection of barware. 100% Lead free crystal || Dishwasher Safe || The glasses are 2.5 inches wide and 4.5 inches tall and holds up to 6.5 ounces.